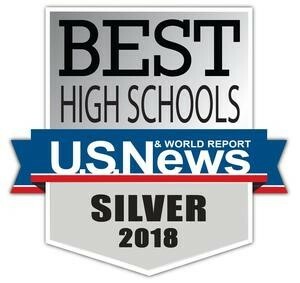 Congratulations to Bloom-Carroll High School for receiving the 2018 U.S. News & World Report's Silver Award and being recognized as one of the nation's and Ohio's best high schools. The U.S. News rankings include data on more than 20,500 public high schools throughout the United States. Schools were awarded Gold, Silver, or Bronze medals based on their performance on state assessments, graduation rates, and college-readiness index results. Only 13% of the high schools throughout the nation received a Gold or Silver Award. We are very proud of the students, staff, and families of Bloom-Carroll High School for being recognized as one of the best high schools throughout the county, state, and nation.